The SBA has recently changed the mapping system for the SBA HUBZone Program. The old SBA mapping system was slow, very hard to navigate and not very intuitive. The new improved SBA HUBZone mapping system is a significant improvement to help to locate SBA designated HUBZone locations. To use the new SBA HUBZone mapping system visit https://maps.certify.sba.gov/hubzone/map. Once on this page, enter the address you are attempting to search. You can also navigate the mapping system by zooming in and out making it much easier to locate a SBA qualified HUBZone location. The system also has a legend that will identify whether or not the address or area being searched is located in a SBA designated HUBZone. One tip when using the SBA mapping system is be sure the address you are searching for is located in a “Qualified” area and is not a “Redesignated” area. Redesignated areas may be currently designated as a Qualified HUBZone location but will be no longer be Qualified after the date indicated in the SBA mapping system. Need assistance with your HUBZone Application? Why should you choose Cloveer Inc. to prepare your HUBZone Application? 1. We live and breath HUBZone Certification! We keep up to date on all of the latest daily SBA HUBZone Program changes. We have a detailed understanding of the current SBA HUBZone Regulations. 2. We have a very strong success rate! We maintain a success rate of over 99% for clients we pre-qualify. We have assisted hundreds of small businesses to achieve and maintain their HUBZone Program Certification. We have real references to back up our success rate, that you can contact. 3. We have 15+ years of experience within the HUBZone Program! All services performed are by Cloveer employees, not outside contractors, like some of our competitors. 4. We won’t waste your time! We pre-qualify all potential clients for our full HUBZone Application Service. We are not interested in wasting your time or ours if you do not qualify. Even if you don’t qualify currently we will identify the workaround to your specific issue(s) so you can apply down the road. 5. We believe in Customer Service! We believe in treating every client with respect they deserve as a small business. Our service agreements guarantee protection of their confidential information. All information provided to us is protected on our secure services and will never be shared with anyone. Finally. We are the best HUBZone Program consultant that is available on the market. The others just try to emulate us. Visit the Cloveer HUBZone Website or call us at 813-333-5800 for more information. There are 5,313 active SBA HUBZone Application firms as of October 2015. 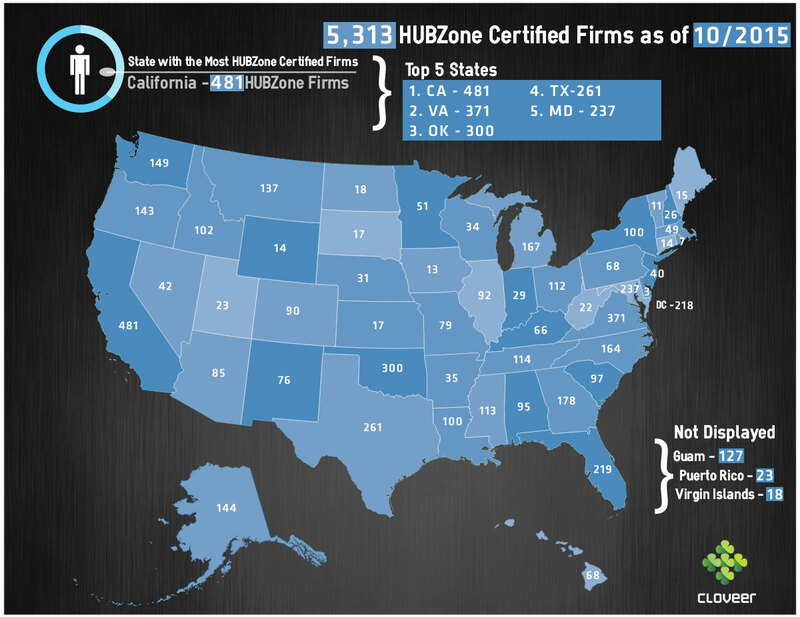 Below is an infographic showing the location by state and number of active SBA HUBZone Certified firms. The source of this information is the SBA Dynamic Small Business database. Cloveer provides products and services on the SBA 8(a), HUBZone, and VA VetBiz programs.